Six members of the association including a past-president, one member each of the Round Table For African American Concerns (RAAC), the Paraprofessional Round Table, the Public Library Section, the College and University Section, and one member at large. Also, the Director of Development, College of Mass Communications and Information Studies at USC who shall serve as a non-voting ex-officio member. 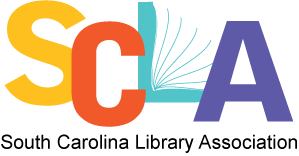 To ensure that an annual scholarship is awarded in the name of the South Carolina Library Association to a library school student(s) of an under-represented population at the USC College of Mass Communications and Information Studies. The school's scholarship committee actually makes the award within the parameters of the gift agreement. Priority is to be given to an ALA Spectrum Scholar who is attending the University, and then to South Carolina residents. To seek donations of funds to augment the scholarship awards. To publicize the awarding of scholarships and present awardees at the Annual Conference. To solicit recommendations/nominations for the scholarship.